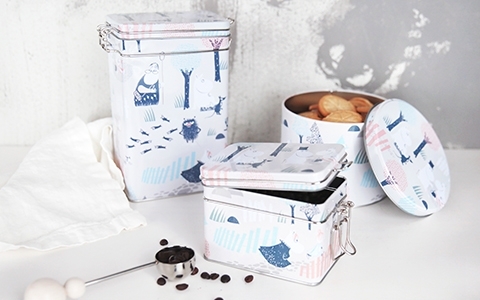 A cute small paperboard suitcase with an illustration of the facade of Moominhouse. By opening the case you can take a peek inside the house! Moominhouse is distinguished by its round architecture and blue colour. On the illustration on this suitcase, you can see the front door of the house on one side and the porch on the other. On the front side, there are Snufkin and Sniff looking out the open windows upstairs, and Little My is standing on the windowsill downstairs, leaning on the window frame, while Mrs. Fillyjonk and her children are standing outside. They are all marvelling at the same thing: Snorkmaiden and Moomintroll who have jumped out one window, to slide down to the yard. Never a boring day at Moominhouse! The back side of the suitcase shows Moominmamma and Moominpappa standing on the porch, leaning into each other. Mymble is reading a book upstairs and Too-ticki is daydreaming, leaning on another windowsill. But who do we find behind the green bush? This illustration of Moominhouse boasts on the lid and bottom of this miniature suitcase. The inside of the case shows the staircase inside the Moominhouse. Little My, Snorkmaiden and Moomintroll and are sliding down the banister while Snufkin and the rest of the Moomin family are standing upstairs, wondering at the racket. Mrs Fillyjonk is waiting downstairs for the merry trio to land on the floor. You can almost hear their delight when you open the suitcase! 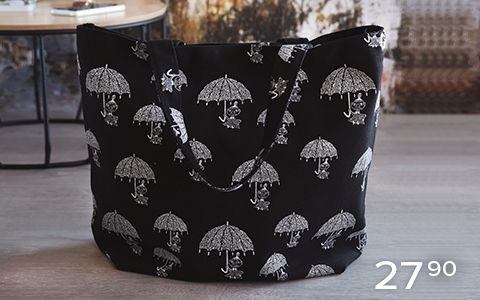 The lid closes with a metallic clasp and the durable white handle makes sure the bag keeps up whether it’s time to romp or to relax. 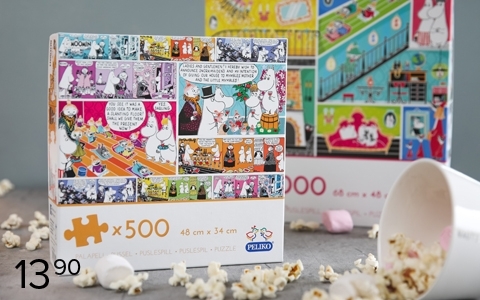 Great for gifting, especially to a Moomin fan!